This month's Japan Times food article is all about dashi. Dashi has been covered on this site many times, but I wanted to write about it for the Japan Times readers because it's so fundamental to Japanese cooking. If you have any desire to make good Japanese food, you need to know how to make dashi. Fortunately, it's not that difficult, using the right ingredients. The article also includes a recipe for a dipping sauce you can use with any kind of cold Japanese noodles. The same goes for katsuobushi, or shaved bonito flakes. The ideal may be to get a whole block of dried katuo, and a special grater. 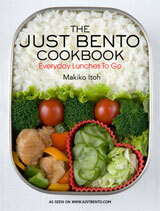 But it's a tedious business, and it can be hard to get a hold of the whole bonito or the grater. Pre-grated katsuobushi is perfectly acceptable. Just make sure you close up the bag tightly after each use (or transfer it to an airtight container) to keep it fresher longer. My original recipe for basic dashi - posted 9 years ago! My opinion about instant dashi powder In a nutshell, it's better than nothing, and these days there are some pretty good powders out there that don't have that harsh MSG taste. But your own dashi is always better. Submitted by maki on 2012-06-25 10:14. Katsuobushi comes in many sizes. Really fine and thin, slightly thicker and what looks like wood curls from a plane. Can you comment on which is best for dashi? Does it have a descriptive label on the package? Dashi is the best! I've been trying to find a dried katuo forever. Can it be sourced online? I thought about using Rakuten and google translate, but I'm still hopeful that there is an easier way. The special grater is easily found. I've never seen whole katsuobushi for sale outside of Japan unfortunately. At least one producer has a web shopping service now (but it ships within Japan only), so with some work it's possible to get. Another thing that makes it very impractical outside japan is that the blade of the shaver needs to be finely tuned to be just the proper height for shaving (or you get powder), which the maker of shavers does - but it will almost certainly have moved during transportation. It took a good 20 min to the japanese lady at my shop to adjust it with a little wooden hammer, and she only remembered how to do that because it was her job to shave katsuo when she was a kid. I seriously doubt I would have been able to do that myself! You can now buy katsuobushi at Amazon. they sell japanese items, but if you call & actually talk to them you can get a katsuobushi & kanna. i had a few other items included, & my total order came to abut $350. 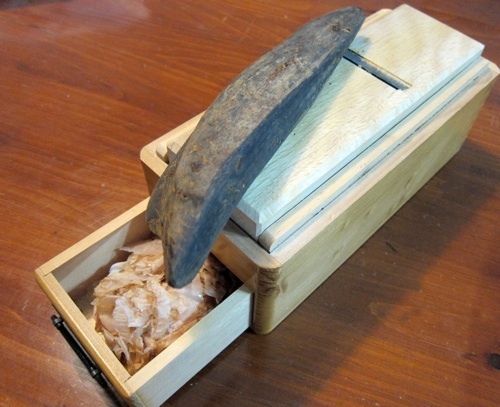 the kanna itself brought up the price a bit, & i think the katsuobushi itself was like $125. I love shaved bonito flakes, especially on Takoyaki or a chunk of fresh tofu. I just read the JT article, and one thing struck me as odd. I've been making mentsuyu to use for zaru-soba for about 2 years now, but it never kept longer than 2 days in the fridge. My recipe is slightly different. (Mirin, Sugar, Soy Sauce, then instant-dashi, all brought to a boil and then left to cool down) With this combination mould starts to grow on the surface after about three to four days. I have read that David Chang of Momofuku has invented a pork product similar to katsuoboshi. Has anyone heard more about it? I like this blog.Your blog is very interesting. Visiting Japan is my dream. As mentioned using finished Katsuobushi flakes is totally acceptable. But I personally find that besides the additional pleasure of making your own flakes the ones from fleshly grated whole katsuobushi blocks are more intense. Is there any telling how high the sodium content is in katsuobushi? I've recently learned that I will need to eliminate as much salt from my diet as possible, so I'm cutting down the soy sauce in recipes to 1/3 (it's tough, but better than not enjoying the meal at all, I guess...). I thought relying more on the flavor of fresh dashi in recipes like takikomi gohan might still make it nice and tasty with the reduction of soy sauce. I'd like to know your opinion. Cool look deeper into katsuo. I've never seen that cool wooden grater or whole katsuo, happen to know of any online sources to find them? Just wanted to say thank you for your recipes. We made agedashi tofu and chicken karage and it was delicious: top notch, restaurant quality. We used another sites recipes for yakisoba and yakitori, which was strange because one of the sites asked for a dashi-soy sauce which i've never seen or heard of. Can you enlight me on this ingredient? I have found a site to order from for kombu and katsuobushi, but I'm a little stuck. What is the kanji for "ma" in ma kombu?